Appartment situated in the centre of Sukosan, with all the shops, restaurants, cafe bars in close vicinity. Also, in the centre you can enjoy festivities and events happening throught the summer and experience the real traditional Dalmatian atmosphere, food and music. The main sandy beach called Children's paradise is just a 10 minutes walk from the centre, and closer rock and pebble beaches just 5 minutes away. In Sukosan you are close to three national parks, and owner can book you trips for them, including also river rafting and kayaking on the river Zrmanja, visit to the nature park lake Vransko etc. You can also rent a boat and travel around the nearby islands. The Villa Seaman's Dream has a joint terrace area for all the guests and offers a free usage of grill. The Villa offers 5 parking spaces. Every appartment has one reserved parking space in front of the Villa. There is a bakery and a shop just 3 minutes walk from the appartment. 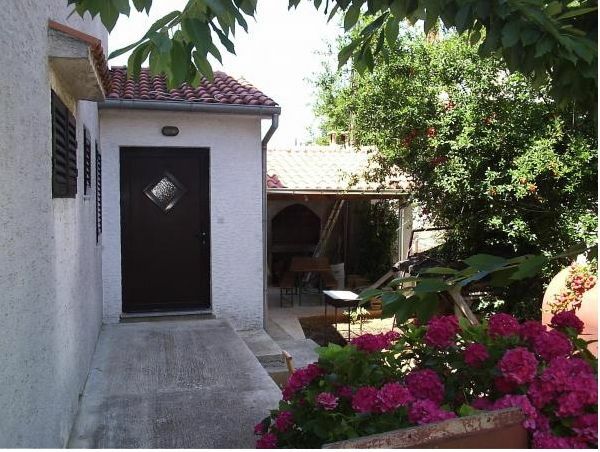 The appartment Hibiscus (***) is situated on the ground floor of the Villa Seaman's Dream. 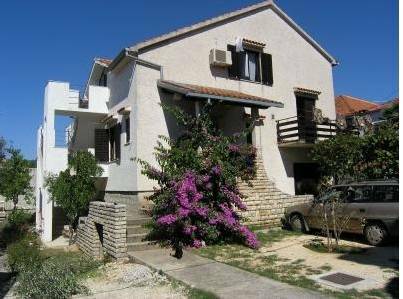 It is newly equipped and has all the neccessary appliances and amenities for a comfortable stay during the summer period in Croatia. 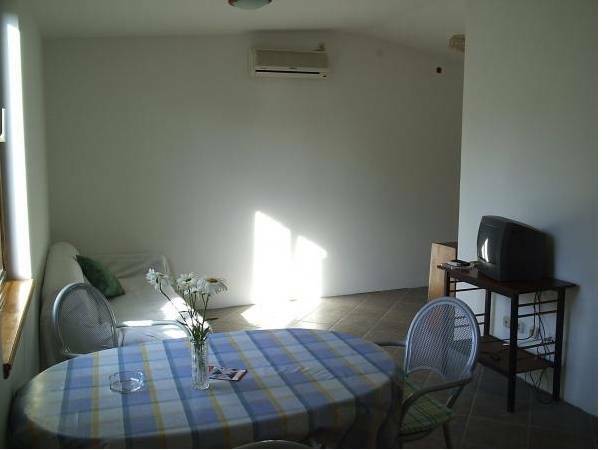 The appartment offers a stay for 4 persons + a baby cottage if necessary. In the bedroom there are two single beds, and there is a couch in the living room that can offer a place to sleep for two extra persons. The kitchen is equipped with all the appliances and cutlery for preparing food. It includes coffee and tea maker, microwave oven and regular oven. 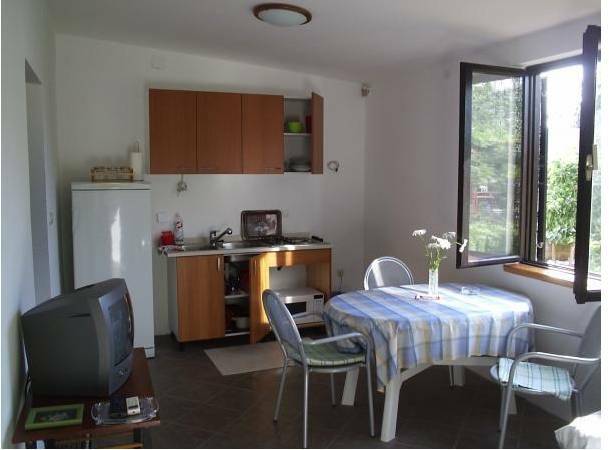 The appartment is next to a joint terrace area with grill for your free use. 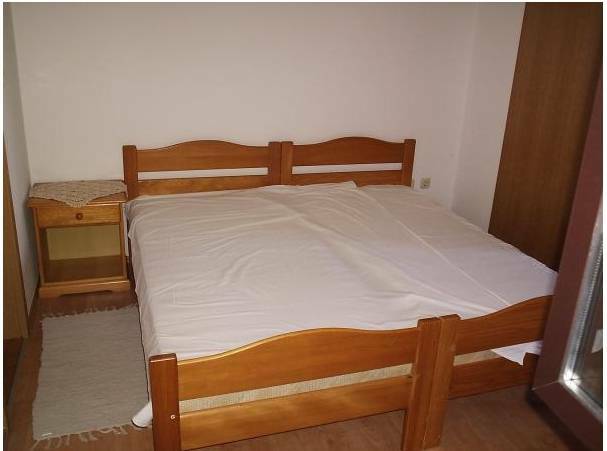 In the price are included for use the linens, towels, electricity and water usage, air-condition usage. The appartment has one parking space reserved in front of the Villa. Sukošan is a place where fertile fields melt with a sky blue sea. Its well indented coast starting from the bay „Zlatna luka“ where the biggest marina in the Adriatic, marina „Dalmacija“ is. Located to the natural complex „Tustica“, is reach on beautiful beaches and numerous small intimate bays. The beauty of the sea and the beaches, luxurious accommodation, friendly hosts along with a rich offer on cultural and sightseeing programs, have been for years the main reason for domestic and foreign tourist to visit and come back to enjoy the „Sukošan summer“. The bond of the traditional and the modern, arranged beaches and untouched nature – a good medicine for body and soul. The vicinity of Zadar (10 km), five National Parks and two Nature Parks, the largest marina on the Adriatic, the vicinity of the airport and the connection to the highway are for sure good reasons to choose us as your destination. The town has approximately 3000 residents. 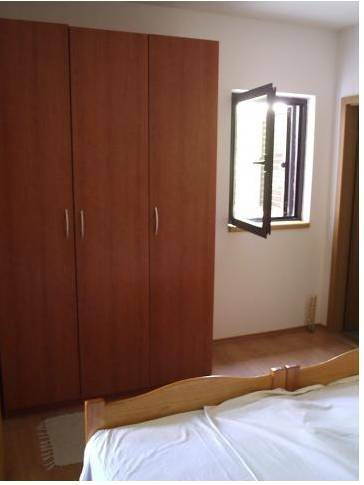 We have a kindergarten, an elementary school with a new equipped sports hall, a medical and dental practice, and everything else that makes this place enjoyable to live in throughout the year and many have recognized it as an ideal place for holidays. Well known restaurant for all the passers by in Sukosan. Offer a wide range of meals for convenient prices. Typical Dalmatian restaurant in the centre of Sukosan, offers Dalmatian cuisine specialities in a typical Dalmatian house surrounding. Dalmatian restaurant specialised for sea food specials. A place where sea lovers escape when embarking from their ship in the Marina Dalmacija. Restaurant right across the Marina Dalmacija, offering croatian cuisine with fresh ingredients from the Zadar and Sukosan markets. If there is a cancellation we shall take 30 percent of the amount, that is the amount made for reservation safety. Villa Seaman's Dream is situated near the main entrance to the Sukosan centre. When coming from the direction of Zadar you just pass the main traffic lights, and we are on the 2nd street from the right, in the street Ivana Devica. Villa is the second house to the right. Guests arriving by bus can exit at the bus station in the centre of Sukosan, and the owners will come for them and take them to the appartment. Guests arriving by plane to the airport Zadar Zemunik, the owners will come by car for them. Guests arrivng by car will be given directions by mail, and the owner will stay in contact by mobile on the day of arrival.